In July 2017, my wife and I moved to a new home and this led to the design and construction of a new, compact 1963-era BC&G layout. These pages document the evolution of the new layout from concept through construction. The new layout room measures 12' x 25'. 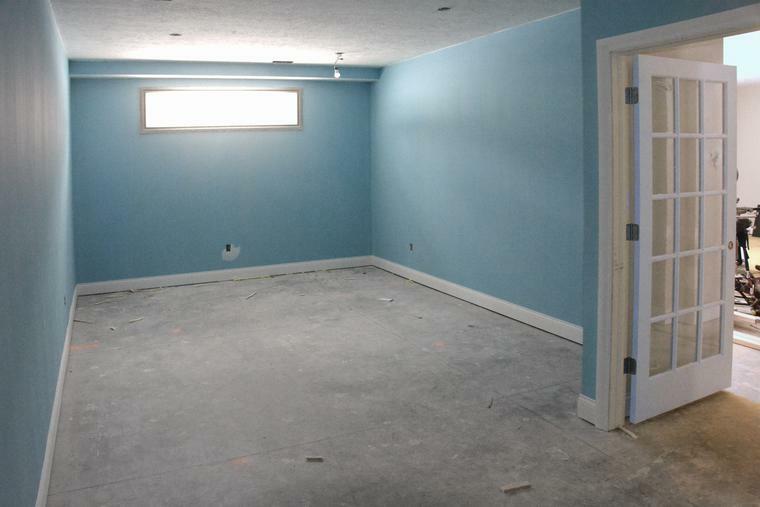 I had the builder paint the walls sky blue and, after this photo was taken, install five 4-tube florescent light fixtures, carpet the floor, ceiling speakers and put one of the wall outlets on a wall switch so that power to the layout can be turned off. As seen in the photo, there is a glass door to the layout room so it can be seen from the adjacent family room that doubles as a crew lounge. 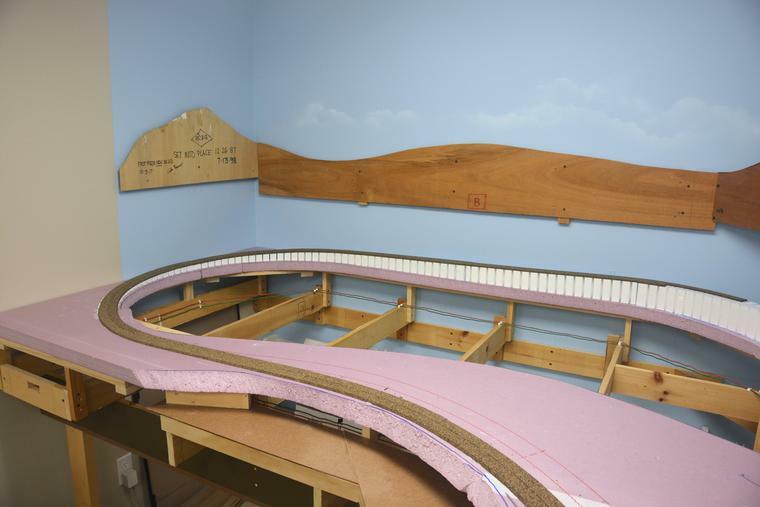 The 'big' layout was disassembled over a period of several months. All the locomotives, rolling stock, structures, figures, motor vehicles, trees and scenic details were packed and carefully labeled. The lumber from the benchwork was cut to size for the new layout, marked and bundled as well. 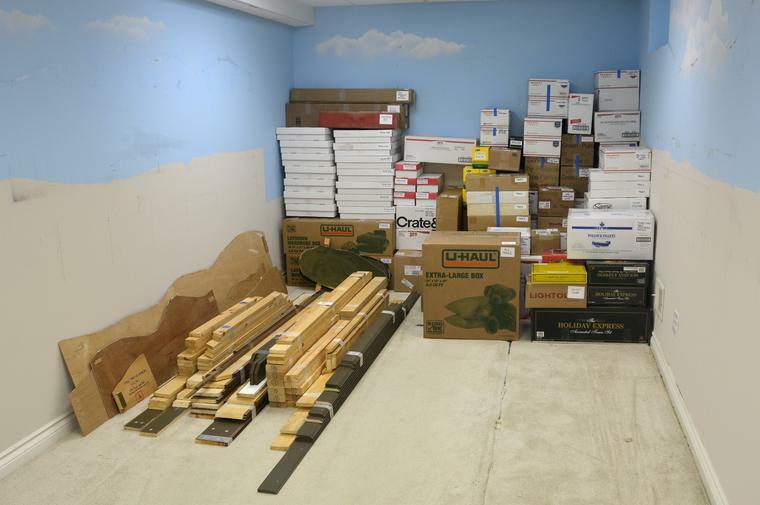 Lumber and track that wasn't going to be used on the new layout was donated to other S gaugers. Four primary and inter-related objectives drove the design of the new layout. All four were equally important and equally played into the decision making during the design process. 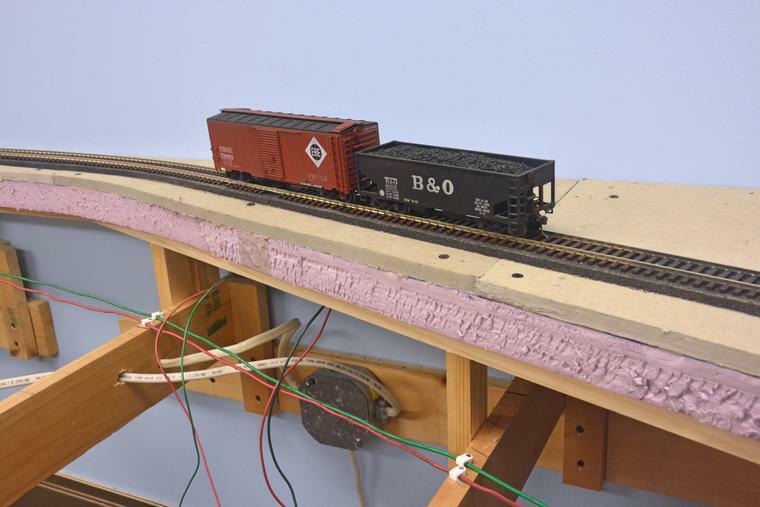 PROTOTYPE FIDELITY - After researching and modeling the BC&G and ERC&L logging activities for nearly 40 years I wanted to have the new layout be as representative of the prototype as it could be considering its size. I knew that significant compromises would be required but wanted to have the track plan and primary scenes based on the prototype. 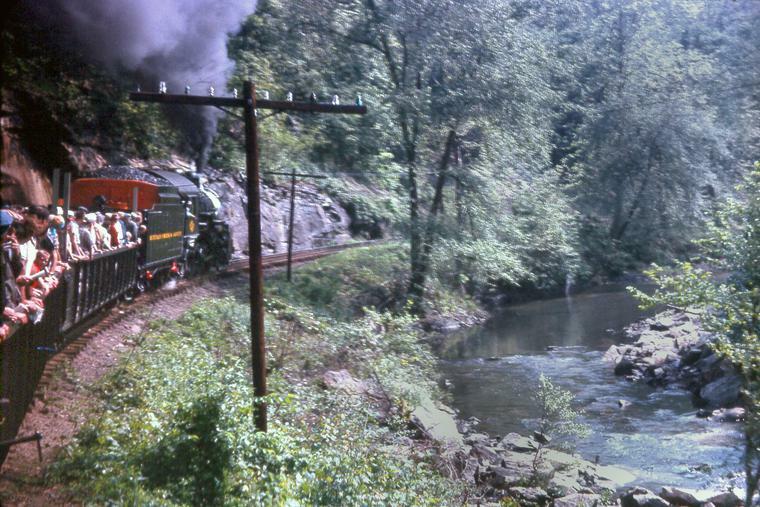 Equally important was to have an operating scheme in which all the trains run would be representative of trains that at one time or another ran on the real railroad. ​PHOTOGRAPHIC OPPORTUNITIES - Sharing my prior layout with others through published photos was an enjoyable part of the hobby for me. 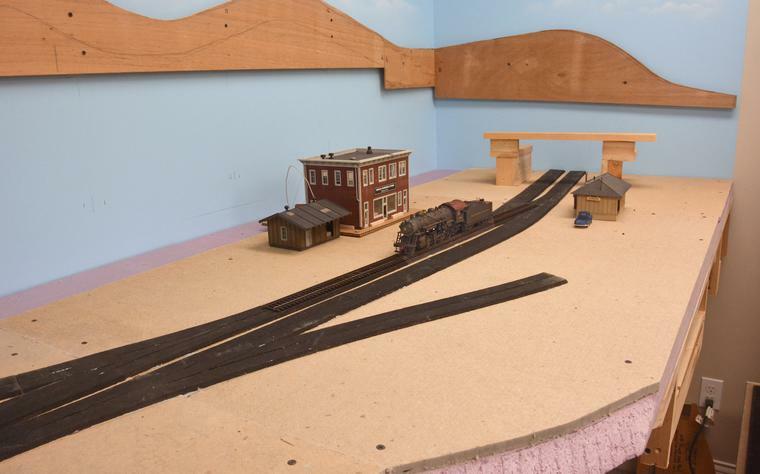 I plan to do more of it with the new layout and so as I laid out the track plan and scenery, I was sensitive to where the good 'photo ops' would be. The bright lighting in the room was done, in part, to facilitate taking at least some photos without the need for auxiliary lighting. OPERATING FUN - I hosted exactly 50 operating sessions on the prior layout and while the sessions will involve fewer crew members and last for shorter periods, I plan to 'operate' this new layout with friends. The track plan was developed simultaneously with the operating scheme. This ensured that the locations and sizes of sidings, staging, and run around tracks would accommodate the trains I plan to run. While trains will be shorter than on the large layout, and they will travel less distance between 'work sites', it should still be fun to operate. OVERALL VISUAL IMPACT IN ROOM - The environment a layout is in can make or break it. I wanted the new layout to fit comfortably in the new space and for it to present a certain level of 'visual drama'. More layout could have been put in the room but I opted for plenty of 'white space' for viewers and operators. The layout shares the room with a desk, shelves and book cases so that my collection of memorabilia and reference material is close at hand. The new layout represents the BC&G in its very final years...1963-1965. 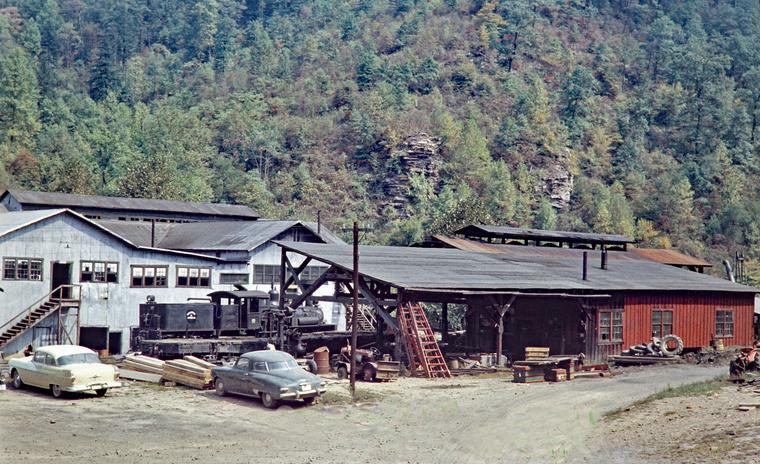 As documented elsewhere on the site, in 1963 the big Rich Run Mine at Widen was closed. 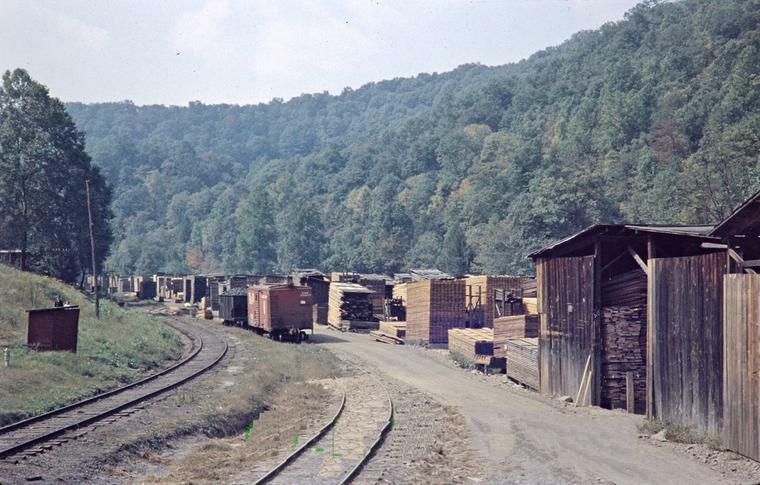 After the closing, BC&G trains ran only 9 miles to Swandale where they delivered empty boxcars and flatcars for loading and picked up loaded cars of lumber destined for the B&O interchange at Dundon. 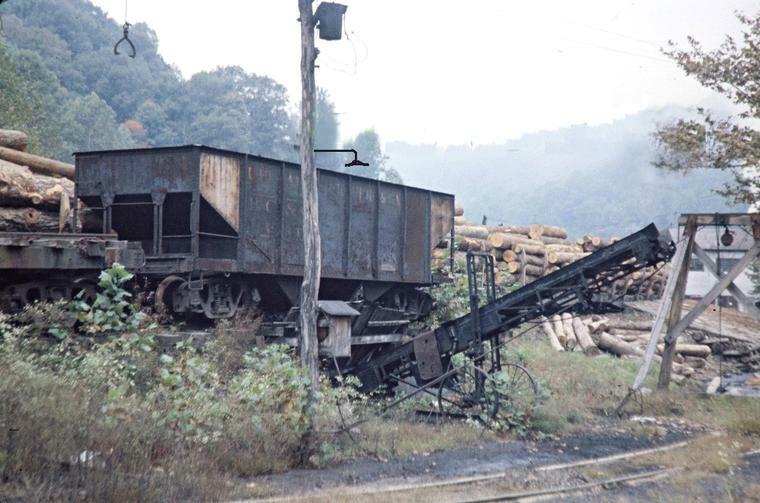 Chip hoppers also appeared in the consists as wood chips from the sawmill were now being sold instead of burned. Trains ran just three days per week and were typically much shorter than in the golden years with 6-8 cars being typical. 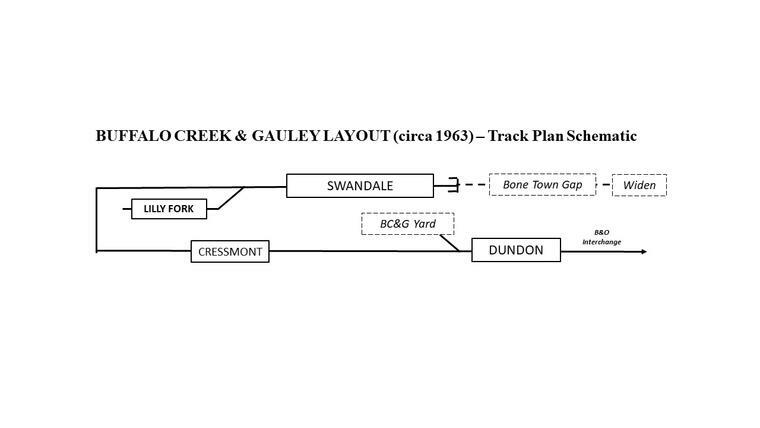 Because there was no place to turn locomotives at Swandale, BC&G engines ran tender-first back to Dundon. 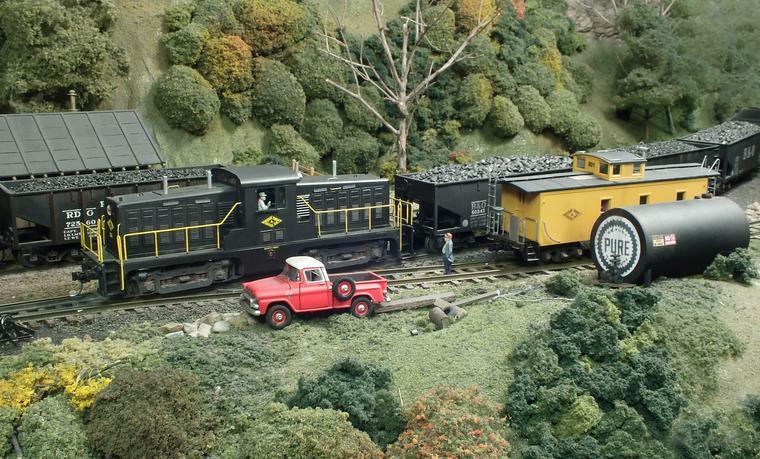 Logging continued in this period with geared engines and the 45-ton Plymouth #20. This operation will also be modeled on the new layout. The track plan above, prepared by Kalmbach, correctly illustrates the major elements of the plan. BC&G engines arrive at Dundon from BC&G Yard (staging) and pick up cars from the interchange. 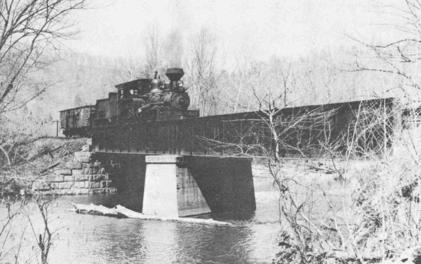 Leaving Dundon, the main line crosses the Sand Fork Bridge and then disappears. It emerges at Cressmont where there is short siding. The track disappears again, starts a 3% grade, and emerges near the junction with the log branch, crosses over itself and arrives at Swandale. The track continues past Swandale into hidden staging that represents the now unused track to Widen...and the track to Bone Town Gap. 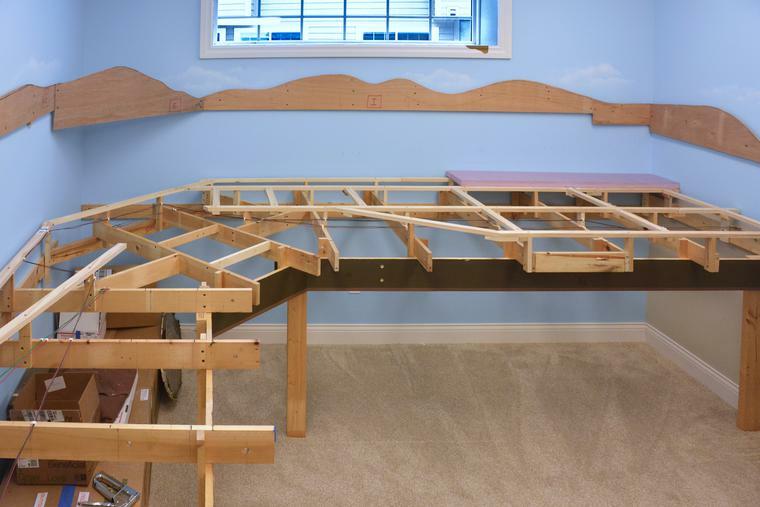 Construction has begun with the primary support structure being built with lumber from the big layout. 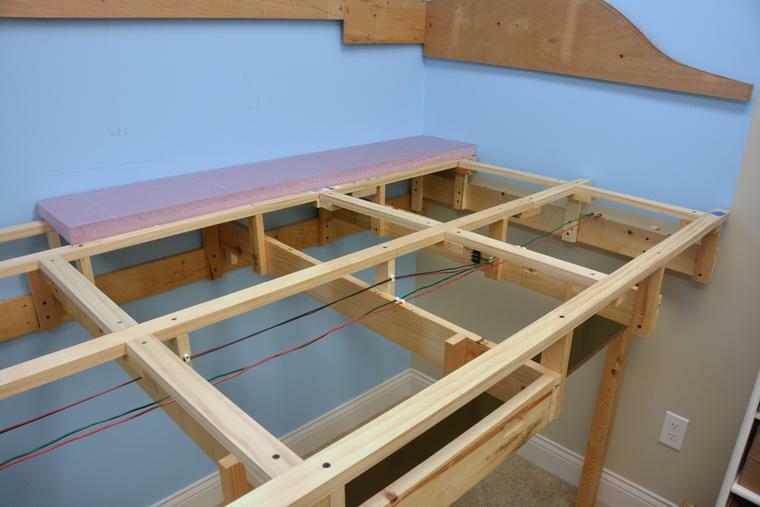 The open grid is 1x2" 'select grade' lumber supported on risers. 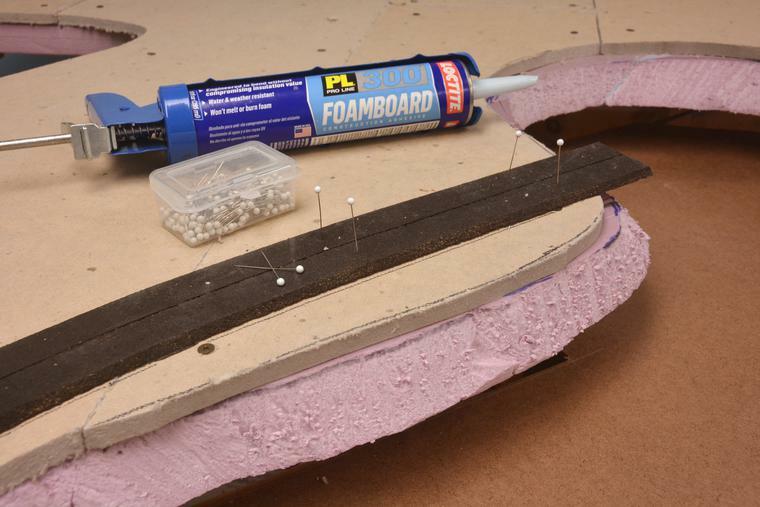 1 1/2" foam is then bonded to the grid with Loctite PL300 Foamboard caulk adhesive. In the photo above right the brown-painted masonite is the base for the river feature and the foam is installed. 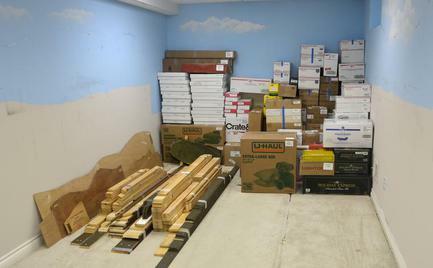 In the photo to the left, a few of the structures have been set in place on what amounts to a full size mockup of the layout as the foam is just temporarily in place. Swandale is on the right, Cressmont is on the lower level and the log camp on the upper level in the distance. I developed the operating scheme for the new layout simultaneously with the development of the track plan. The location and capacities of run around tracks and sidings were established with specific train movements in mind. Operations on the large BC&G used prototype-inspired printed switch lists and trains ran on a schedule controlled by a fast clock (see “Adding Operations To A Model Railroad”, December 2009 Model Railroader). 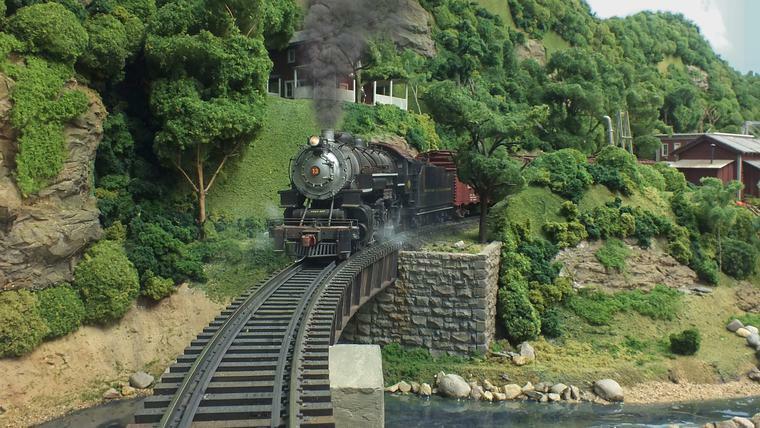 I plan to use a similar approach on the post-1963 layout but it won’t be until the layout is operational that I will determine if trains should run on a fast-clock schedule or simply run in sequence. I find that having a detailed vision of how the new railroad will operate is not only critical in the design but is also a strong motivator to getting it built. Seven different locomotives lettered for three railroads can be operated in each session and all of the trains are representative of ones that ran on the real BC&G at one time or another with the focus on the line’s last years of operation. 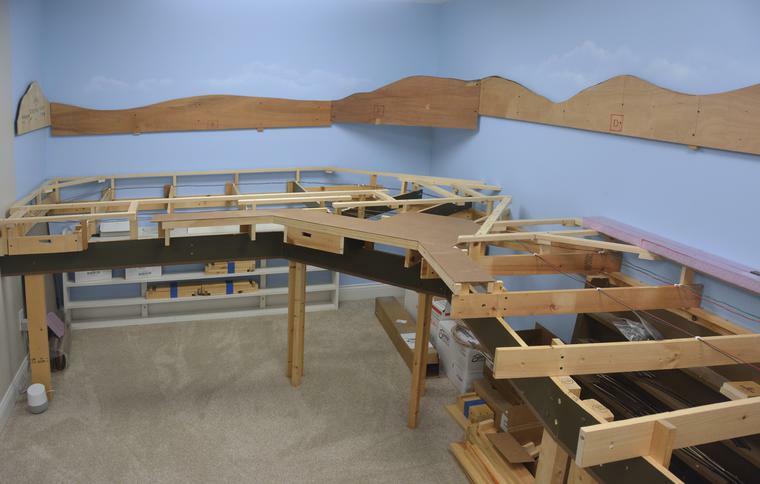 Here is how the layout will be "staged" and the trains which will be run. 1. BC&G Milk Train 1 – Mack Railbus ‘A’ moves out of barn, stops for gas at pump, picks up ice at ice house then passengers board at Dundon station. Departs Dundon, then makes a stop at the Cressmont dairy and proceeds to Swandale and ties up on company store siding. 2. BC&G Swandale Turn 1– BC&G Consolidation arrives at Dundon from BC&G yard (hidden staging) with caboose and a freight car or two, switches station track and then makes up train of cars from interchange and departs for Cressmont. After switching Cressmont it continues to Swandale where it switches the mill, lumber docks and store, then makes up return train of finished lumber and chip hoppers. 3. BC&G Swandale Turn 2 – The train of finished lumber and woodchips leaves Swandale behind Consolidation running tender first and returns to Dundon where the station track is switched before spotting cars on Interchanges. The engine returns to BC&G Yard (hidden staging Track 1) with C-1 and a car or two. 4. 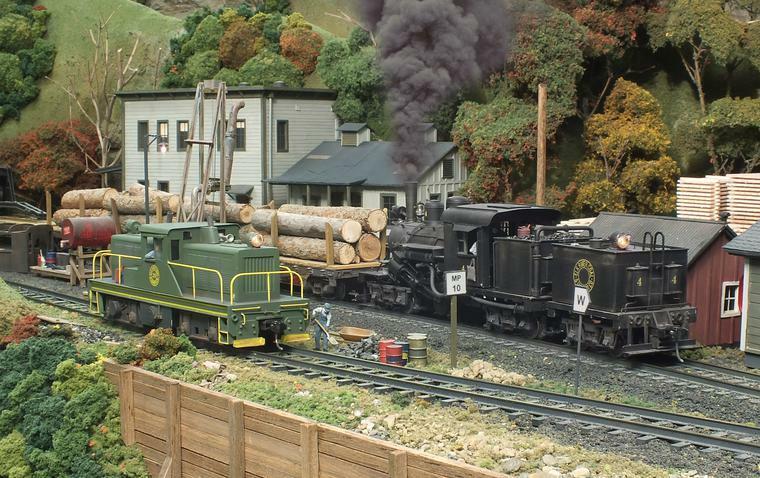 ERC&L Log Train 1 – After taking water and coal, Climax #4 makes up train of empty log flats from the log pond track and the logging caboose. The train departs for Lilly Fork log camp, swaps loads for empties and spots the flat car-mounted crane in position for loading empties. 5. 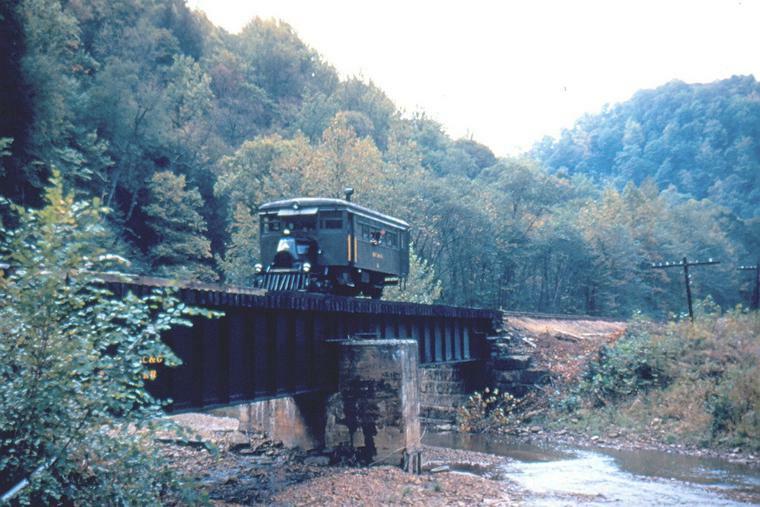 ERC&L Log Train 2 – Climax #4 departs Lilly Fork with loaded log cars and returns to Swandale. 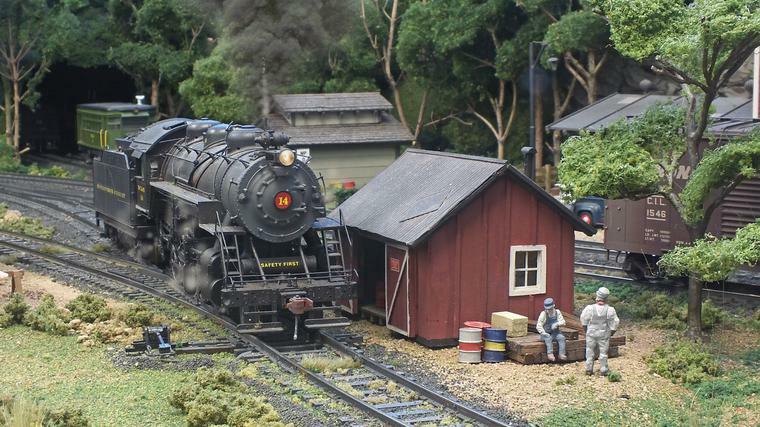 Loads are spotted on the log pond track, the engine takes water and then ties up on the engine house track. While Trains 4 and 5 are run, the B&O interchange track is 'fiddled' with the freight cars being replaced with empty hoppers. and the Railbus is turned around to face the opposite way. 6. BC&G Coal Train 1 (CT1) – Leased B&O RS-1 #9185 arrives from Dundon Yard (hidden staging) with C-2, makes up train of empty hoppers from interchange track and picks up empty hopper from Bower Coal. The train proceeds to Swandale, picks up an empty hopper from coaling track then holds on passing track for BC&G Coal Train 2 (see CT2 below). After CT2 passes, CT1 proceeds to Bone Town Gap (hidden staging). 7. BC&G Coal Train 2 (CT2)– Whitcomb #20 arrives at Swandale from Bone Town Gap (hidden staging) with loaded hoppers, meets CT1 on passing siding, and sets out loaded hopper for coaling track. It also picks up caboose C-2 from Coal Train 1. It then proceeds to Dundon where a loaded hopper is spotted at Bower Coal with the remainder of loads going on the interchange track. 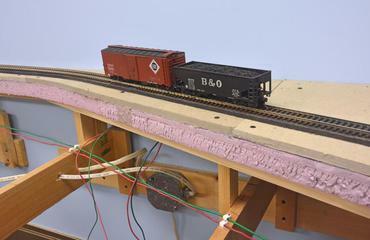 Engine and caboose proceed to BC&G Yard (hidden staging). 8. ERC&L Service Train – Climax #3 makes up short train of MOW equipment from Lilly Fork, proceeds to Swandale, switches store and engine house track and returns to Lilly Fork. 9. ERC&L Swandale Switcher – Plymouth #20 switches Swandale, including spotting loaded hopper on coaling track and moving empty cars into position for loading and pickup. 10. BC&G Milk Train 2 – Bus A departs Swandale, makes stop at Cressmont and proceeds to Dundon station to unload passenger then returns to bus barn. 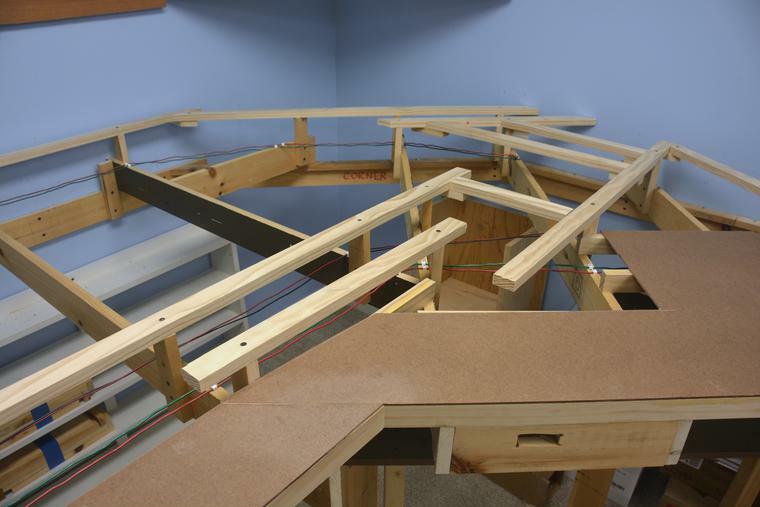 Can a 12' x 25' S scale layout provide satisfying operations? Here are two images of post-1963 staged on the prior layout. On the left, Plymouth #20 meets Climax #4 in Swandale. 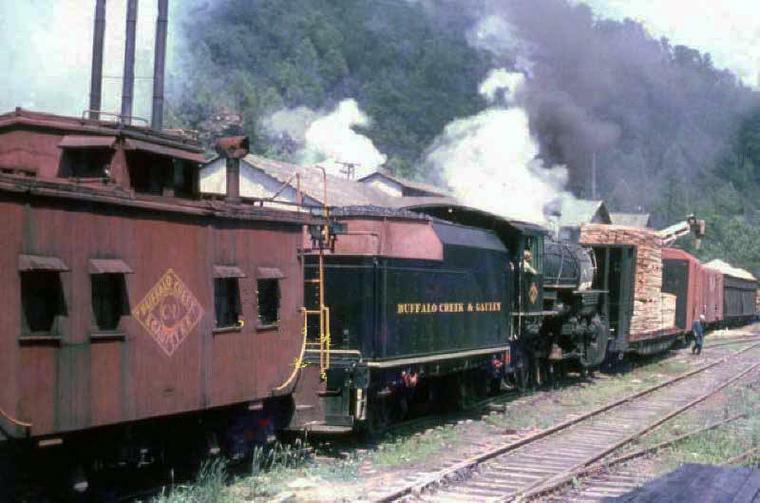 On the right, BC&G (Majestic Mining) #20 prepares a short train of hoppers for the trip to the interchange. That's caboose C-2 (ex-PM) behind the Pure fuel tank. Both these scenes will be part of the new operating scheme. In planning the new layout I went back through all the photos on the site and selected a number which I want to use to inspire scenes. Here are some of them. I saw first hand during the speeder trip on the right- of-way that I took in 2007 that in many places the track ran on a narrow shelf between rock cuts and the creek. I want to duplicate this look in a couple places on the layout. One of the most photographed places on the BC&G was the 142' Sand Fork Bridge. This photo shows how it looked after being rebuilt in the early 1960s with the large concrete center pylon. The full story on the bridge is HERE. 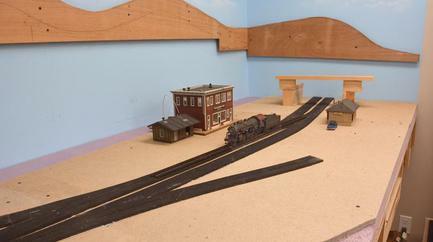 Swandale is the visual and operational center of the new layout. It will actually be a larger and more accurate representation than on the prior layout. I'm planning on building a more accurate model of the engine house (left) and there will be a specific siding serving a larger lumber stack (below). In addition, the coaling track for the logging engines will be included (below left) this time. To the left is the benchwork at the Cressmont and Log Camp end of the layout. Notice that the DCC bus and wiring for the 9V structure lighting has been installed prior to the installation of the foam. 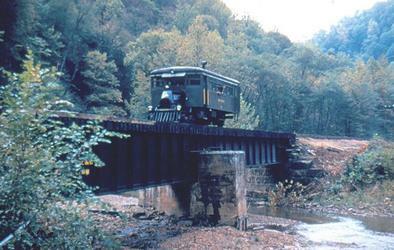 The bridge at Cressmont was also often photographed as it was easily accessible by road. 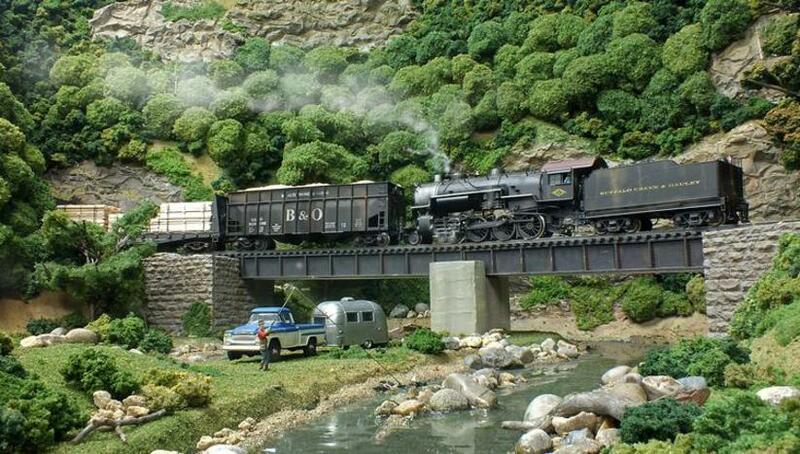 The plan is to have a bridge similar to this at Cressmont. Notice this is a 'through' girder bridge while on the Sand Fork bridge the track runs on top of the girders. Woodland Scenics foam riser system was used to create the 3% grade behind the log camp. It works just great for S track. It was glued to the 1 1/2" foam and the cork roadbed was bonded on top. This multiple-outlet box was connected to a wall outlet that is on a wall switch at the door to the layout room. All of the DCC and lighting systems will be connected to this group of outlets so that the entire layout can be powered on and off from the switch at the door. 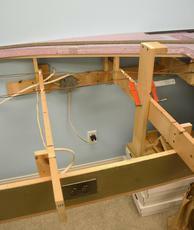 Notice that the Romex is held securely with either staples or by passing through holes in the benchwork. The red and green wires on the right are the buses for the 9V circuit for structure lighting. Small plastic 'clips' hold the wires in place on top of the rafters. Starting to look like a railroad! 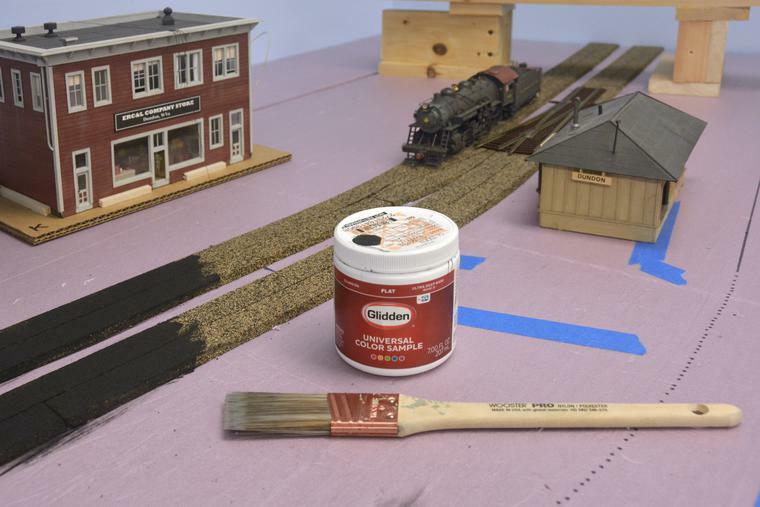 Cork roadbed from Scenery Unlimited was bonded to the foam with Loctite FoamBoard adhesive along centerlines drawn on the foam. The cork was then painted black with inexpensive flat black latex paint. The dotted line below the brush handle in the photo is the centerline for the siding behind the station that will be laid directly on the foam without roadbed. At this point I temporarily laid some track and ran trains over 12' of track and discovered that there was a great deal of noise transmitted by the surface of the foam. After experimenting with foam and Homasote road bed, I concluded that the best way to quiet the noise was cover the surface of the foam with 1/2" Homasote. I removed the cork roadbed already laid, installed the Homasote and reinstalled the cork. Above Left - This is the Dundon area with the Homasote down and cork roadbed reinstalled. Above - This is the portion of the roadbed that runs along the wall 'below' Swandale. The foam with Homasote overlay is clearly visible. 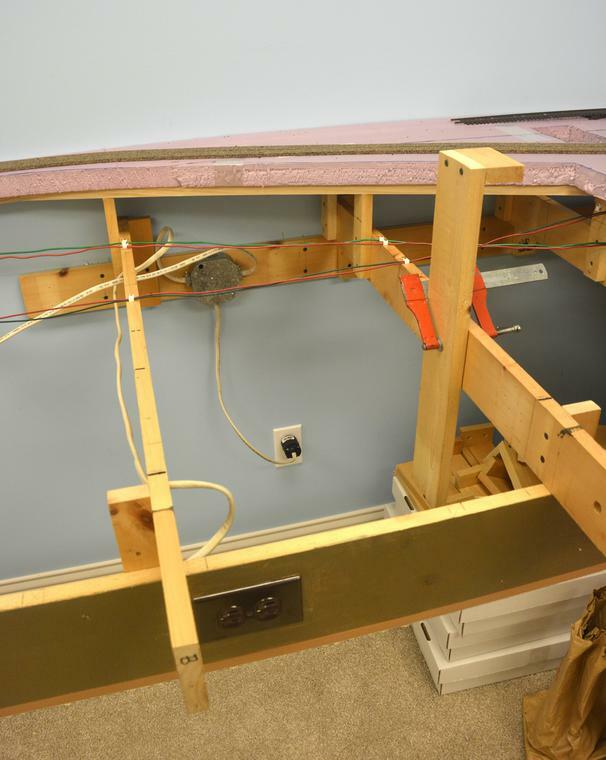 The two pairs of wires coming from the track are feeders that will be attached to the DCC bus wires running horizontally above the rafters. Left - The Homasote was bonded to the foam with Loctite Foamboard adhesive caulk. Drywall screws were used to hold the two together until the adhesive set. Cork roadbed was attached to the Homasote with the same caulk and held in place with pins until set. After some experimentation, work is proceeding using a plaster-free technique for building landforms. Profiles are made from 1/2" pink foam. 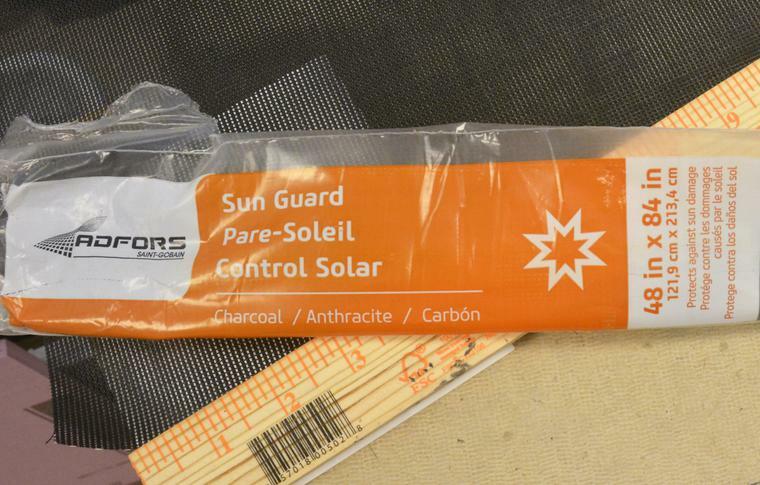 Black plastic screening (the type used for sun-blocking screens which has very small holes) is attached to the profiles with hot-melt glue. 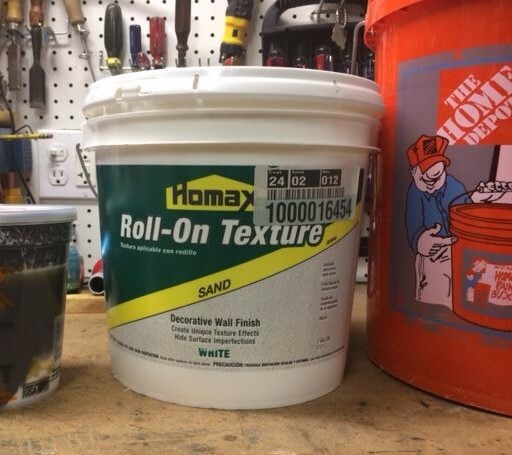 Bob Stelmach, a fellow S gauger, uses a thick texture paint called Homax (available at Home Depot) over metal screen. I used the same product, tinted green by Home Depot over the plastic screen material. When dried it produces a sturdy hardshell. Click on town name to go to page with details on that section of the layout. Many thanks to the folks at KALMBACH for allowing me to post this track plan that they prepared. 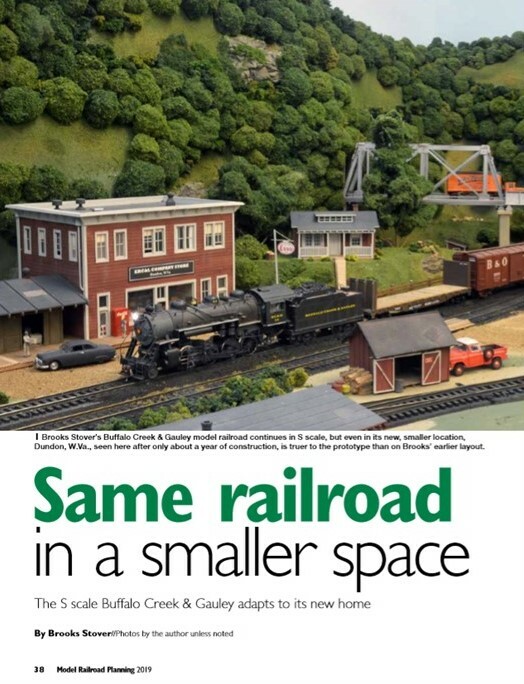 For the full story of how I decided to build this new layout, including how and why I decided to model the BC&G again in S scale, see MODEL RAILROAD PLANNING 2019, published by Kalmbach and available on newstands and directly from Kalmbach now. 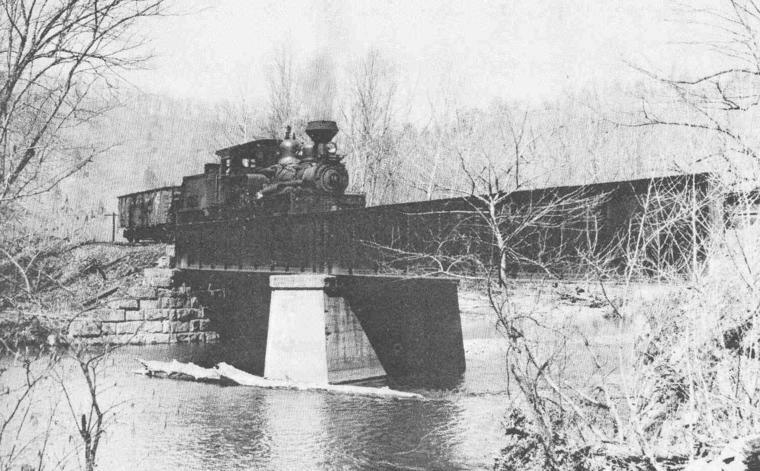 The article entitled "Same Railroad in a Smaller Space" begins on page 38. BC&G Consolidation #13 has just passed the rail bus shed and the water plug outside of Dundon and is crossing the 142' Sand Fork Bridge on my new, compact rendition of the railroad as it was in its final years of 1963-65. That's Elk River Coal & Lumber Co. president J.G. Bradley's house up on the hill. 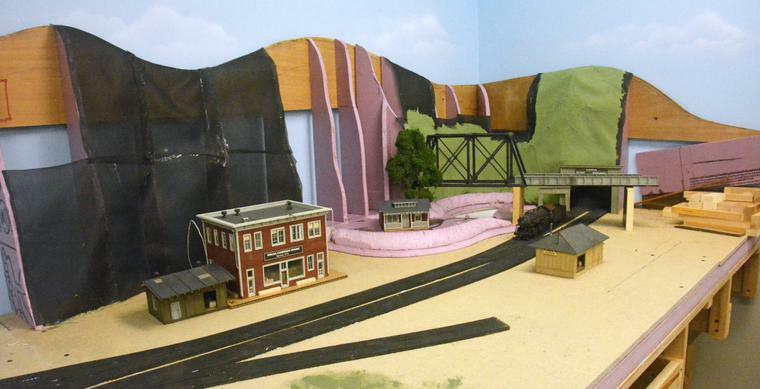 Who says you can't have dramatic scenery on a smaller layout? The crew of BC&G #14 is taking a break between assignments. The engine has been pulled onto the coach track siding at Dundon on the new compact layout. Mack Railbus Motor 'A' can be seen pulling onto the BC&G main in the background behind the engine. The bus will stop at the the ice house for a couple of blocks of the cold stuff before pulling up to the station to load a couple passengers. 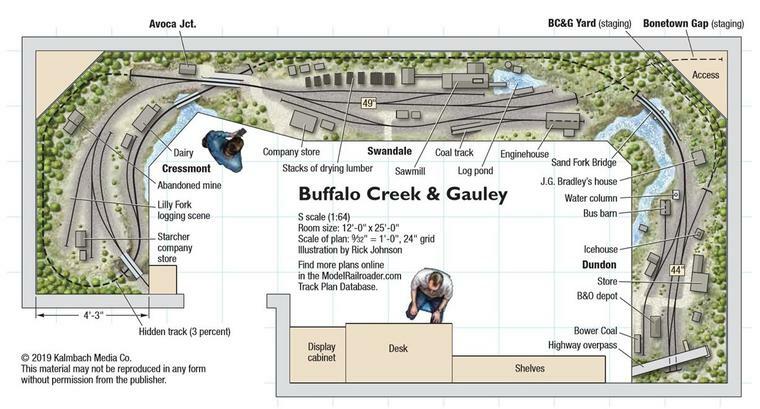 If you care to share comments about your interest in the BC&G or your thoughts on the new, more compact version of the BC&G in S scale as it was in 1963, please leave a note on the GUEST BOOK!